I would appreciate the assistance of a wordsmith in picking the baton and helping Chef Bne and La France make it to the GNR finish line. GNRs are desperately need in the West Suburbs. Thank you - I was planning to make this nomination myself. This place is an interesting contradiction. 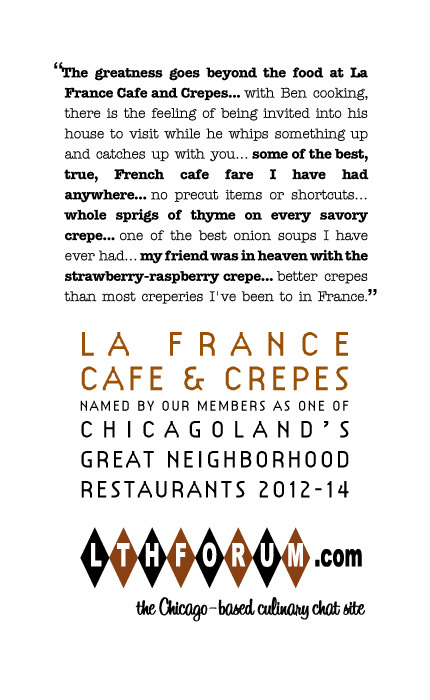 I do not think it is ever going to be a real favorite of a lot of people on LTHForum because of its location in the suburbs and its specialty - crepes, for pete's sake! Their loss. La France is a wonderful story, serves great food, and is a properly unassuming, personal and idiosyncratic establishment like the best of the GNRs, in my opinion. Let me explain. First, it is a tiny location, with a basic kitchen in which Ben works his magic, often challenged to keep up with the orders when more than 2 of the 5 tables are occupied. Hours of operation change seasonally, at times without as much notice as one would like, though they are somewhat regular these days and someone will answer the phone to tell you what they are. Call first. Service is provided by Ben, the chef and owner, and his young, part time assistants, often from College of Du Page, or the high school a block away. Ben is an accomplished chef of North African origin, a Nouvelle Cuisine guy (to distinguish from Escoffier, though what the French call Nouvelle Cuisine is what most of us would recognize as classic French food these days, nothing novel or new about it at all). He started with Cafe Bernard a while back and worked his way through a string of good kitchens and restaurants, at least one his own. One of the financial crashes of the last decade killed that, and after a break he decided to pursue a family-friendly, more relaxed path, and opened La France. Now he can cook, enjoy visiting with his customers, and also spend time every day with his wife and children. Quite admirable. And it is not unusual to encounter a member or two of his extended family in the back of the restaurant. I cannot say whether Ben has always been a friendly and sociable guy, but he certainly is now - greeting every customer, catching up on this and that, swapping tales while he cooks. In some ways, it reminds me of another GNR - Burt's Pizza. Ben may be a little more mainstream, but there is the same feeling of being invited into his house to visit while he whips something up and catches up with you. And they both have been doing this a while and are doing it today in exactly they way they want to do it. And then there is the food. Ben is clearly a much smarter and more talented chef than I could ever be, as what he whips up is pretty much always delicious, perfectly done. Steak, chicken, salmon, mushrooms, onion soup, croque monsieur/madame, as well as a range of sweet crepes. Richly sauced, nicely plated and garnished. It starts with the complementary salad - a few pretty leaves topped with chunks of cucumber and apple, some sort of dried fruit, and a perfectly flavored and emulsified vinaigrette. It amazes me what he can whip up. The result, for me, is some of the best, true, French cafe fare I have had anywhere, far better than just about anything I have ever had in Chicago. And if all that comes with a warm welcome, leisurely service, enjoyable conversation, that is only the proper, French way. if you are in a hurry, look elsewhere. No need to repeat what has already been posted on the specifics of the food, but know this. It is easy enough to go in, have a little chat with Ben about this and that, let him know what you might be in the mood to eat, and he will make you a something that is not on the menu to satisfy and delight. Engaging, delicious, and excellent. Trust Ben with your time and stomach and he will deliver. I have been there and enjoyed the ratatouille crepes. Its a very unique place and everything dicksond says is true. Its amazing what the chef whips up with a very primitive set up. Literally, he pulls a block of cheese out of the fridge and grates it on the spot as he makes your dish. No precut items or shortcuts. It does take a while for the food. The only thing I was not fond of was the mint tea. But there are other drinkables there. Interesting experience.